Supernova remnant W49B is unique in shape, size, and age. When a star goes supernova, material blasts out relatively evenly, creating spherical formations of hot gas and dust. Compared to this expected model, W49B appears more uneven and barrel shaped, revealing more matter was released from its poles. 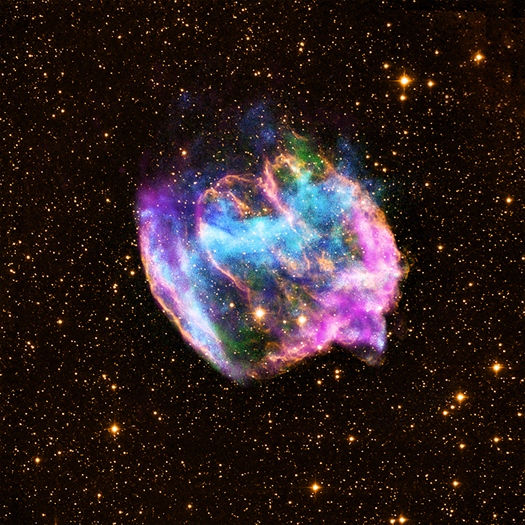 This asymmetrical explosion challenges the supernova model astronomers believed to be true. A typical supernova also leaves behind a neutron star, but none can be detected within the area. Instead, W49B left behind a black hole. Further evidence is needed, but if it is certain a black hole exists in W49B, it would be the youngest known black hole in our galaxy, the Milky Way. W49B is approximately 1,000 years old, measures 26,000 light years away from Earth, and located in the constellation Aquila.